portable video tower on the market today. Weighing only 7.5kg, Vantage Point is the lightest video tower on the market making it so easy to move, transport and assemble. Vantage Point comes with simple fittings that allow you to assemble or take down the tower in a matter of minutes. Vantage Point is the most cost effective and easy to use portable video tower on the market today. It’s unique design makes it convenient to transport and so simple to use. You can begin shooting high quality video footage from Vantage Point straight away, wherever you are. 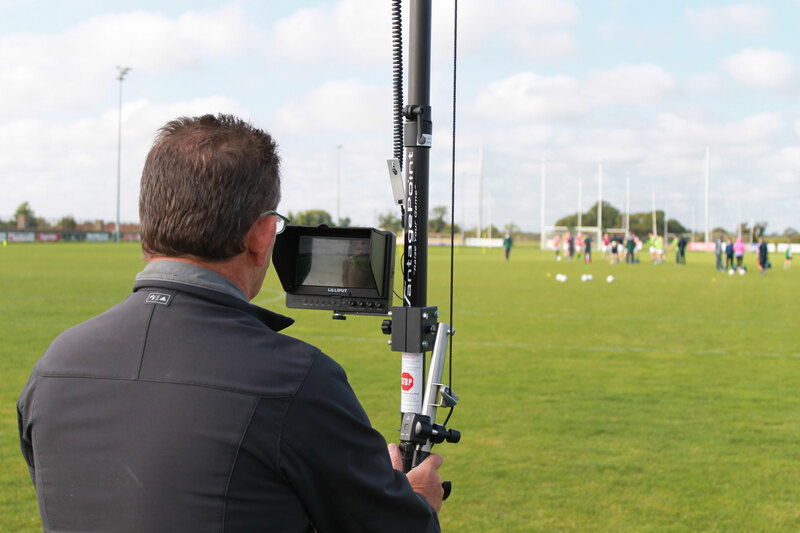 Vantage Point was designed by Toca Sports as a response to 20 years of coaching experience using expensive hard to transport video towers, ladders and platforms. We decided to design a simple, inexpensive touch line camera support, to gather excellent usable footage for great analysis and improved performance. Vantage Point also comes with a complete all-weather kit included in the price, so you get a sun cover, rain protection gear which includes a camera housing waterproof, monitor waterproof cover and remote control waterproof cover and no added fees to enjoy all weather protection. Its unique design makes it convenient to transport and so simple to use. You can begin shooting high quality video footage from Vantage Point right away, wherever you are. Vantage Point the most affordable system on the market.It comes complete with all that is needed to start capturing great footage. Just take a look at who uses our system already. Many systems on the market require both hand to control the Camera and tower. Some systems use a battery operated pan and tilt head which requires a separate remote control unit that the remote for the camera. This system can be slow to move with the action of many sports. ,With Vantage Point All Camera controls are worked off the one lever arm leaving one hand free to should it be raining. Until you have been filming out in the rain this may not seem important at time of purchase. Weighing only 7.5kg, Vantage Point is the lightest video tower on the market making it so easy to move, transport and assemble. It’s made from the latest premium grade materials so you don’t sacrifice strength for weight either. Vantage Point folds up smaller than other portable towers, meaning it will fit in any car but can extend to 6 meters (18ft. ), so you can always find the perfect angle for your shot. Many of the towers on the market come with large carrying cases making them very bulky for taking to away fixtures. We’ve all been there, freezing fingers and complicated mechanisms make setting up portable towers a painfully slow and frustrating process. Vantage Point comes with simple fittings that allow you to assemble or take down the tower in a matter of minutes. 10 minute set up and you are ready to shoot. It can also be easily moved during the game if required. Here’s a list of questions that customers often ask us. Please contact us if you can’t find the answer you’re looking for. How much does Vantage Point cost? We have an number of options depending on application and the Camera preference of the analyst/ club. Wireless Panasonic Sony or Canon. How heavy is Vantage Point? Vantage Point is lightweight, weighting only 7.5kg. It is the lightest video tower on the market making it easy to move, transport and assemble. It’s made from the latest premium grade materials so you don’t sacrifice strength for weight either. Is Vantage Point difficult to transport? Is Vantage Point difficult to set up? No. Vantage Point comes with simple fittings that allow you to assemble or take down the tower in a matter of minutes. Setup take less than 10 minutes. Can Vantage Point be used in the rain? The service we received from Vantage point was second to none, we received the product within a short period of time, any small issues with set up, Stephen was on the phone to help. Would highly recommend the product to anyone within the game, it really helped us having this equipment at such a reasonable price. Use the details below or the form to send us any queries you might have. © 2018 VantagePoint. All Rights Reserved. Designed by CC Designs.